We are so excited to introduce you to Caroline! Caroline Ryan is our kind of beauty! She is a young entrepreneur who is following her passions. She has created a business that both fulfills her and makes others happy. The life we all pursue! After college Caroline took "the best" job she was offered, under the impression that is what one should do. After giving it her all, it didn't feel right or fulfilling. Following some serious soul searching, Caroline knew she was willing to take the risk and pursue work that she felt truly passionate about and utilized her creative strengths in design. 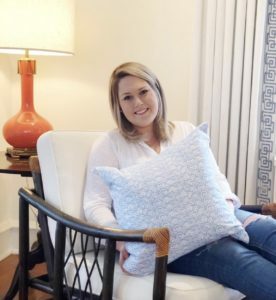 Combining her degree in Business and Event Planning from the University of Alabama with her grit and determination Caroline created Fourteenth Floor Interiors. Her company supplies College students bedding and accessories to create the perfect home away from homefeeling. Fourteenth Floor Interiors is a culmination of all of Caroline's wishes. She is using her gifts, helping other college students pursue their passions (all designs for materials are by current college students) and making college student life a little bit more happy and cozy. Caroline won't deny that being an entrepreneur comes with long days and late nights. She admits a good night sleep is the best beauty secret. However she would never leave home with out her Drunk Elephant C-Firma Day Serum and her forever go to Lancome Hydra Zen Anti-Stress Moisturizing Face Cream. She feels the combination keeps her skin bright and moisturized. Caroline needs to be out in front of people all day with her trunk shows and her new showroom. We suggested our all time favorite lip gloss for a pop of color and staying power. Buxom Full On Lip Polish in Clair. I know you want to see her things! We just ordered a full set for Your Basic Beauty's Maggie for her dorm room in the Fall. Caroline has been nice enough to offer our followers a discount. Use "yourbasicbeauty10" for 10% off your orders. Go to website here: Fourteenth Floor Interiors. along to watch and enjoy. Sleep Tight!! !